As I continued to struggle with working with color, I decided for some reason to try Pointillism in my images. 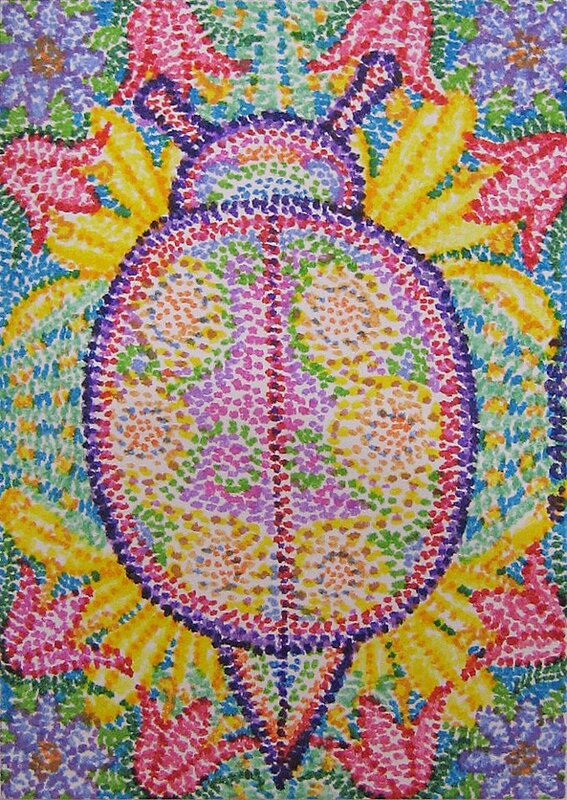 Using dots of color with magic markers, I created images that came to my mind. I found relief in the fact that I didn’t have to mix colors just choose them from a box of 100 markers with thin tips. 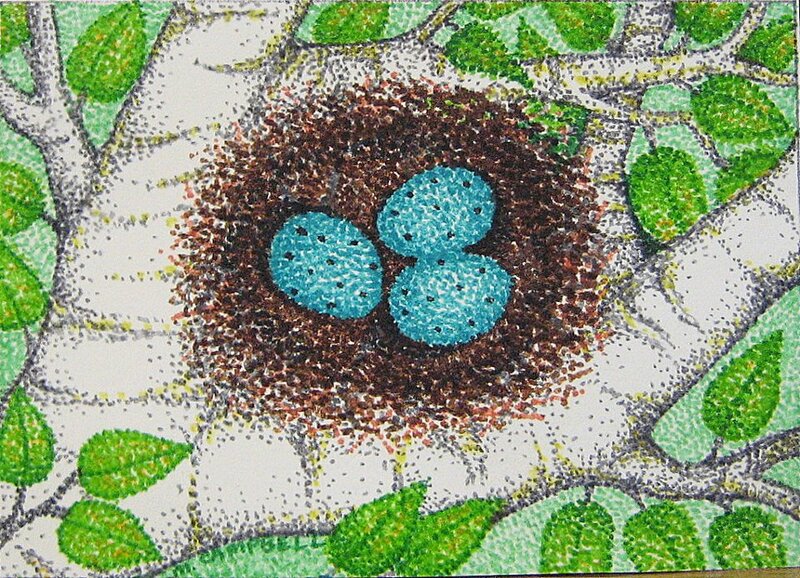 The first image I created was an ACEO (Art Cards Editions and Originals 2.5″ x 3.5″) of a Robin’s Egg Nest in White Birch Branches. My cousin owns the original for this one. He said he had taken a liking to it and wanted to try it for himself. I found as I worked that I could enjoy the process more because one stress factor was eliminated … that of mixing color. Another stress factor that was relieved was that the markers were strong and stable. Not like a paint brush with flexible bristles that you had to exert more control over. So the only things I had to worry about were choosing the colors and shading, and I could just enjoy the rest of the process. Over the years I created more with pointillism until I got tired of it and wanted to try something else. But for the time I used the technique, it worked for me and served a purpose. 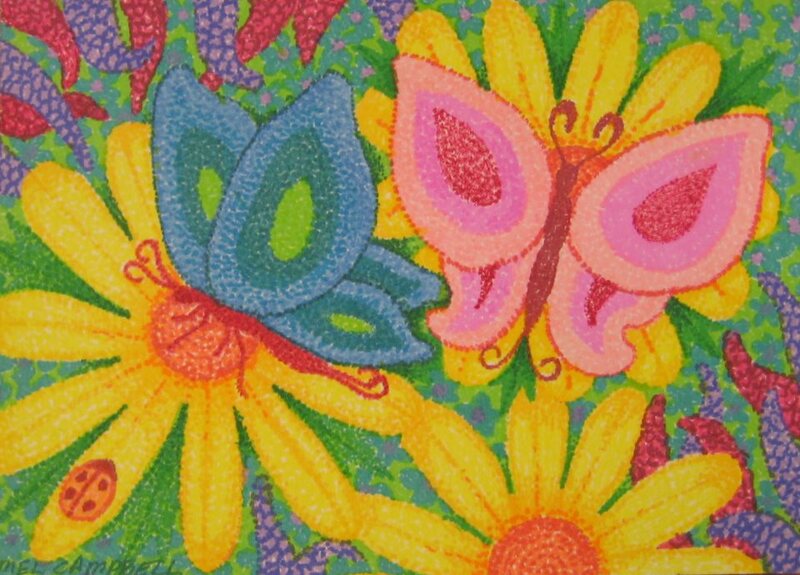 Here are more things I created using pointillism in color. How about you? Have you ever tried a form of art to relieve your stress. Did it cause more or less stress? I have always felt more comfortable handling black and white art because I enjoyed exploring different ways to control the mediums I used. When it came to color, I felt frustrated because there was TOO MUCH to control. I was on control overload and this frustrated me. I guess as an artist, I am too much of a perfectionist. However in 2009 I discovered an art form quite by accident while scrolling for art on Ebay. It was a tiny version of a regular piece of art. I saw art that was original and I also saw art that was shrunken down and made into giclee prints. I joined a couple of groups on Ebay that created mini art, and started rising to their challenges each month to create ACEO’s of my own. 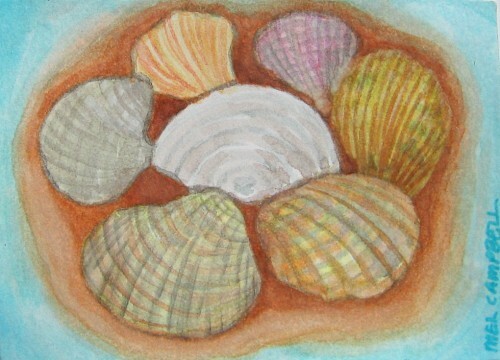 ACEO’s are 2 1/2″ x 3 1/2″ sizes of art. This is near to a business card size. ACEO mean Art Cards Editions and Originals and are collector items like baseball cards are. In fact an ACEO is usually protected in a hard plastic baseball sleeve. The story for these tiny pieces of art came from long ago when artists in Europe wanted to give a sample of their art to prospective buyers. They would create these and pass them out. Over the years, they became collectible. I’ve personally seen them sell for as high as $250 on Ebay. I’m sure there are those that sell for more. 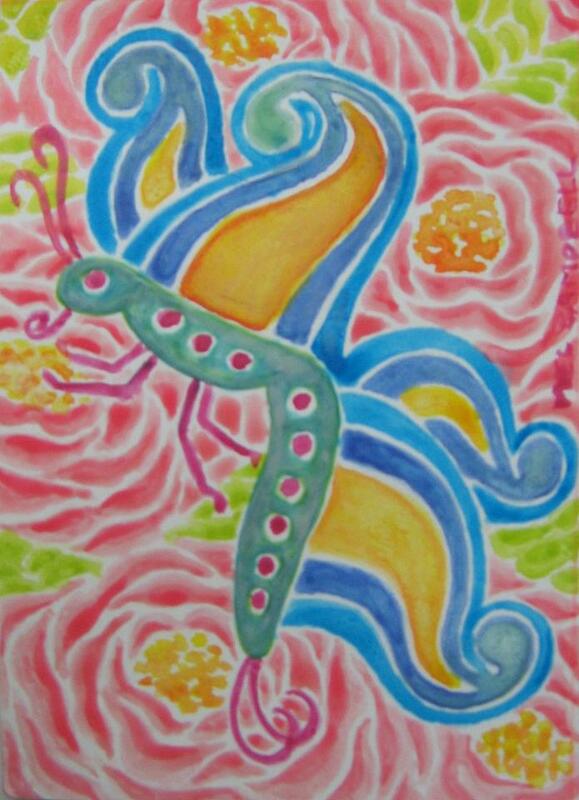 I have both created and sold my ACEO original Art and Editions. 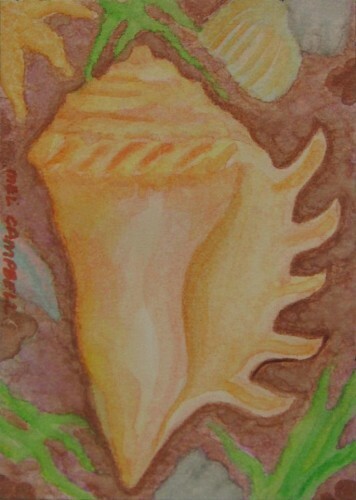 At the top is my most sold art for ACEO Prints. 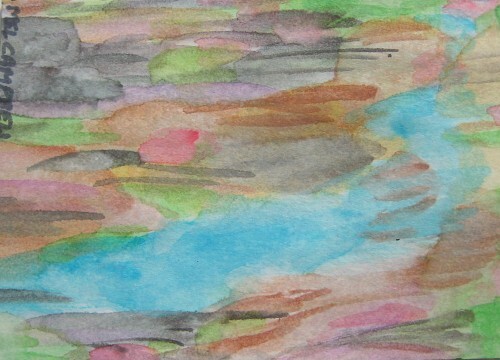 It is a piece that was created from a testing area I was using for watercolors for another painting. (See above.) When I saw all of the colors in this area, I thought, “I can’t waste this, I have to do something with it.” So I looked it over and decided it looked like an abstract version of a Japanese Waterfall. If turned sideways it looks like a river (See left photo). So basically there are two pieces of art in this one piece. It’s never been so easy for me to create a piece of art and this one was truly a surprise. Watercolor continues to be my biggest challenge as an artist. I tried creating several ACEO’s with watercolor. 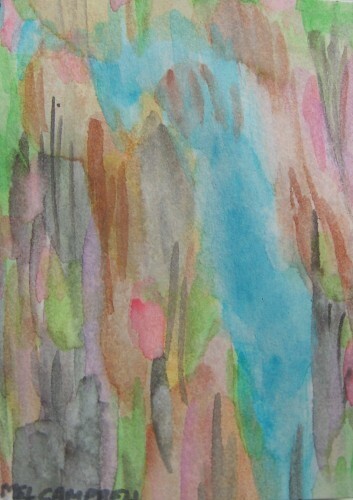 Because these are small, the frustration of handling color is still there for me, but on a smaller scale. I don’t feel as overwhelmed. My watercolors continue to look overworked, and I have not yet been able to capture the fluid and carefree style that true watercolor artists display in their work. It may take a long time before I’m able to get to that point of true fluidity. They make it look easy for sure. 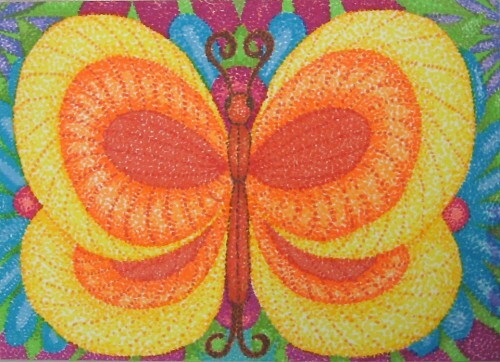 This butterfly was my first attempt that I made in an ACEO form. Following it are other attempts. So as I work with tiny art, I keep exploring techniques that are uncomfortable for me to increase my understanding of both the technique and my skill using it. It is less of a risk this way, but produces good results. At some point I’ll be ready to create a full size piece of art to use the new skills I’ve developed. How about you? What challenges have you overcome and how did you do it? Sickness – Benefit or Hindrance? When sickness comes, do you see it as a benefit or a hindrance? A friend recently got sick for 24 hours and was bemoaning the fact that her day was ruined. She didn’t need this to happen to her today, she had too many important thing s to do. Isn’t that how we all react? At least initially. Of course it depends on the type of sickness. My friend’s lasted 24 hours and when she returned to work, she had three fresh and viable opportunities waiting for her. She hadn’t really missed a thing. She was fortunate. Some people experience sickness that lasts for quite a while and might even end in the death of a loved one or themselves. This prolonged illness can really take a toll and add to the initial shock of finding out you have a disease that isn’t going away soon and maybe never. We experience a gamut of emotions, thoughts, worries, fears, exhaustion, changes in plans, financial burdens, pain, and so much more. Illness is a part of life that comes almost whenever it wants to and leaves you the way it wants to. If I had to put a human characteristic on it, I would have to say it is narcissistic in nature. It doesn’t care what you want. It has it’s own agenda and goals. It wants to beat you up, deck you out, crumple you up, and spit you out to say the least! But there are benefits to this side of life. No, I’m not lieing. 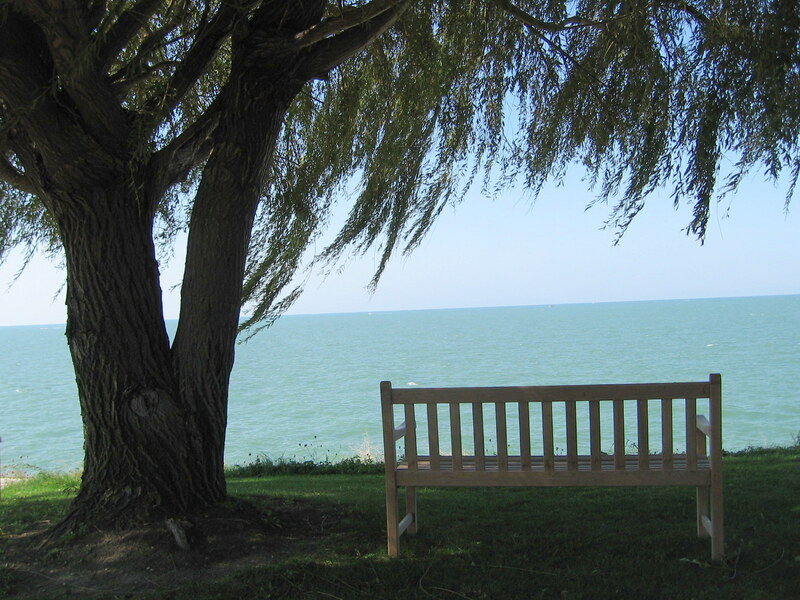 Sometimes illness comes because we need to stop and take account of ourselves and our lives. I’ve heard of people who have near death experiences and then when given a second chance, have a heightened sense of what is really important for the rest of their lives. The unimportant has been pruned or cut away. Others go through the death of a loved one, and are able to comfort others appropriately because they’ve walked in their shoes. There is a camaraderie that develops between strangers when they share illness experiences. Some have made friends for life because of their illnesses when they might never have met otherwise. There is a sense of hope when people of like problems share how they coped. Sharing what they experienced that another is only starting to face, makes the unknown less frightening. They share resources and ideas on how to deal with finances, and other issues that present themselves such as taking care of children, meals, and ways of helping everyday life run as normal as possible in the midst of this redirection. All of these help with the acceptance of the illness as part of life and to ride the roller coaster of the illness for as long as is necessary. No I’m not suggesting that we go looking for illness for that would be masochistic. But when it comes unexpectedly, we can find benefit amidst changes we hadn’t bargained for. We can find purpose amidst the senseless destruction of the predatory illness that would seek to devour us mercilessly. Would you care to share your experiences with Illness? Perhaps someone else will benefit from what you share and have hope in their future. Do You Have Enough Time In Your Day? Most of us wonder where the time went at the end of the day. If you are like me you still have too much to do at the end of a day. I am experiencing that right now. At 63, I seem to have less energy than I used to have. Plus being a bit under the weather has forced me to slow down and nap more the last couple of days. And things start backing up when sickness occurs. Being single and unemployed, I can’t pass things off to someone else that I need to take care of: Packing garbage for Thursday pick-up, buying groceries, keeping up with Ebay listings, writing blog posts, chores, feeding and caring for a cat, taking my meds and making sure I refill them, going to doctors appointments, listening to webinars that promise a hefty and profitable 4th Quarter, and the list goes on. Sometimes I stand in the middle of the room and cry HELP ME GOD!!! I often don’t know what to do first or what I want to see accomplished at the end of the day. Everything seems to be important and maybe it is. I’ve found that the crying out to God actually works. He makes something catch my eye or my thoughts and I go do that, then something else will come to my attention and I’ll go do that, etc. Before I know it, I’ve gotton tons of things accomplished, my stress level has decreased, and my self-esteem has been repaired. If you don’t have a relationship with God, you can try thinking of the 3-5 most important things in your day that really need to get done by the end of the day. You want to be able to lay your head on your pillow at night and not be disturbed by thoughts of incomplete projects, or things your mind brings up when it should be settling down for the night. What will it take to get those done or at least taken to the next step? If by some chance you get them ALL done, then go to an auxiliary list of the next most important things that need accomplished and pick something from that and so forth. Give yourself some down time in your day also. A 15 minute cup of flavored coffee where you put your feet up, stare at a rosebush and just think of how good the coffee tastes will go a long way to relaxing your mind, freeing up your spirit, and improving your perspective. Whatever it is that will accomplish this for you, do it! Don’t let the day be ALL about you though. Take a little time to focus on someone else. Write a note of thanks, or send a greeting card with a message that you know will encourage another. You want to do something that will help someone else, but will not take you down a rabbit trail that takes you off course in accomplishing your goals. Maybe you want to plan a meet-up with someone – just call and ask when they are available and avoid a long conversation at that moment – save it for the meet-up. This will help to get your mind off of yourself for a while, and put life into a better focus. Well these are some of the things that were mulling around in my mind as I look forward to an extremely busy day tommorrow and some ways I was thinking of surviving it … smile. How do you tackle busy days? Do you have any unique strategies to share? When you are an artist, frequently you work with color. You apply it in different ways on different kinds of surfaces with different types of tools. Your job is to control the colors, understand how they relate to one another, communicate something to others with them, and decide/plan what the visual outcome will be. What you can’t control 100% is another person’s thoughts or reactions to what you have made. They do not know the different decisions you made to arrive where you did and why. They may not even care unless they have a relationship of some kind with you. But even then, they only have their reactions to go by in the final analysis. They may love it, or hate it, or be indifferent to it, even if they know you personally. The reason for this is th at we react to colors, shapes, and textures differently. We are individuals and as such we have separate brains, emotions, preferences, personal history, and understanding. Often colors are an emotional choice for us. Many people love the color Blue. It’s endearing, it’s soft and romantic. It’s the color of the sky, the ocean, flowers, and more. Things we tend to love and be gently attracted to. Even a harsh Blue can still be enduring because at it’s base is Blue. Red on the other hand can agitate us if it’s too harsh. It is an aggressive color, loud, dominant, and also loved. Red is a very important color to the Chinese, especially for celebrations. Red is seen as a power color as well. If you have to give a business presentation and it is important for you to demonstrate that you are in control, wear Red. (Please note: Make sure your presentation is well prepared and delivered because just w earing Red won’t save you … smile). Green is a calming color. 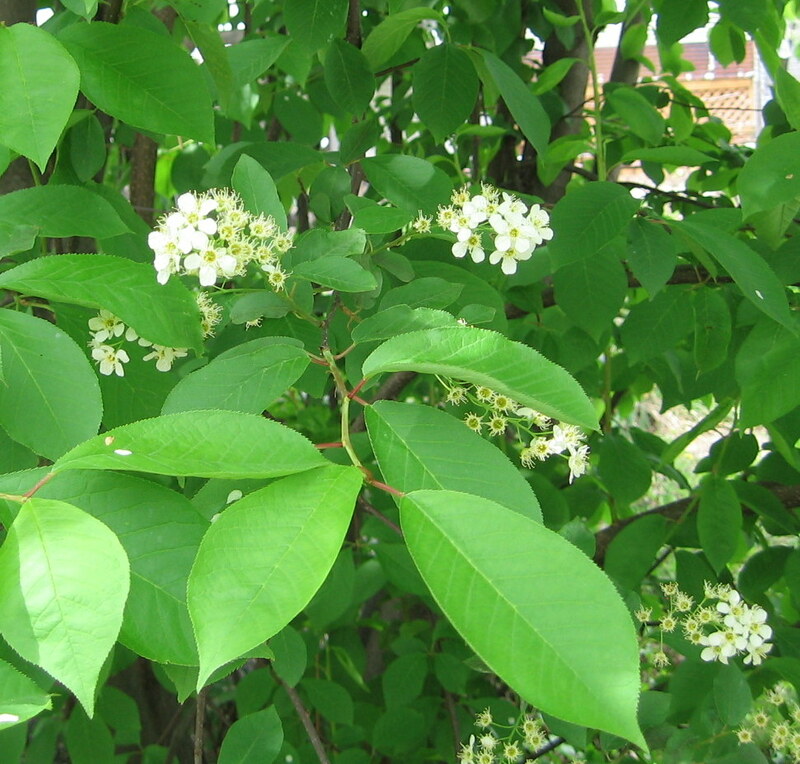 People associate it with growth, and living things. It makes us feel secure. The only time it doesn’t feel secure to me is when I see it on hospital personnel or hospital walls. Then it makes me feel sick. 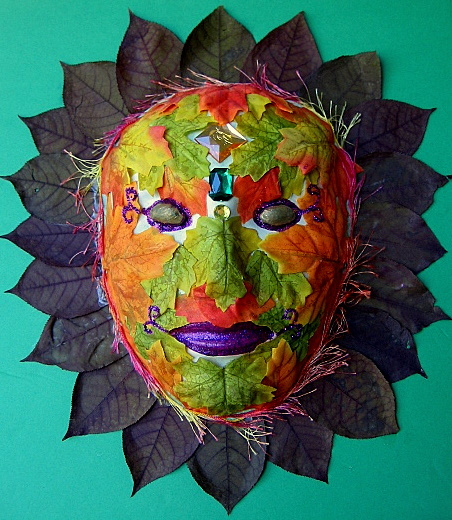 There are whole websites devoted to the Psychology of Colors and how they affect us. Colour Affects is a website in the UK with some very interesting information on eleven colors and their psychological affects on us. This is a very interesting read. Click on the name in this paragraph to go to their website and discover the properties of color on our mind, emotions, and reactions. For me personally and as an artist, I’ve been gravitating towards creating art with a variety of colors. I’ve used watercolors and markers primarily to create realistic and unusual pieces that my mind and emotions come up with. I’ve displayed some of them throughout this blog post. How do you react to the colors used? Do you sense peace or irritation? Are you soothed or confused by the colors? Do you love them or hate them? Please share any thoughts you may have about your own color preferences. I usually go to church each Sunday. We have four services, but I usually attend the 9am one. I’ve been going to church all of my life as a ritual. When I was little my mother made sure we went with her while my father opted to stay home. That must have made her feel really good … hmmmm. Well anyway, due to some circumstances at home, I could not attend today, but I missed hearing my pastor’s thoughts. I’ll be able to listen to them on the internet next week as they are recorded, but I still miss hearing them fresh. When I was older, I went to church because I liked it. I wanted to know God personally but sadly after 12 years of religious training I could not tell someone how to become a Christian. It dawned on me that I could give information to people on how to become a member of my religion, but I could only tell them about God from what someone else had told me and not a personal perspective. It wasn’t until I was in college, that someone told me how I could know God personally for myself, and not second hand through someone else. The sixth step was to accept that God made me His child through His Son and that I have everlasting life in heaven with Him. John 5:24 “Truly, truly, I say to you, he who hears My word, and believes Him who sent Me, has eternal life, and does not come into judgment, but has passed out of death into life. This is how I came to know God personally and Church became an intimate encounter with God and His Children instead of a Ritual to be observed. Once I believed God’s plan as outlined in the Bible and gave my heart and life to Christ, asking Him to dwell in me, it made all the difference in the world. Do you have a similar story to share? Please feel free to tell us about your own spiritual journey. Is this an American phenomenom or are people in other countries happy when the weekend rolls around, especially if they have it off from work? For many years I used to survive the week with the expectation that the weekend was mine and I could do with it what I pleased. Well to a certain extent anyway. No punching a time clock or being under the thumb and watchful eye of company watchdogs. I used to work in a place where you would hear immediately if you did something wrong, but rarely complimented when you did something right. Good Grief. No wonder people live for the weekends! So now in unemployment and in anticipation of retirement, my weekends roll into the weeks. There is no distinction and I have to be more mindful of when they come. They seem like the other 5 days of the week, except that Sunday is a church day for me. If it weren’t for that, I would hardly know the weekend was here. It is Saturday today and I must keep that in mind, for the sake of others. If I want to get together with friends, I have to be mindful that they still work and their schedules aren’t as free until a weekend. I have to be sure that if I have any business to take care of, that I do it during the business week if it involves a company that doesn’t work on the weekends. So even though I don’t live the work week like I used to, I still have to be aware of it. I guess I still get to be glad it’s the weekend then. For others. I rejoice with you that you have two days off … smile. How will you spend it? Because you know it WILL go quickly and before you know it, you’ll be punching that time clock again on Monday morning … HAVE A GREAT WEEKEND!